‹ PreviousWill you blog for software? Now now….let’s not start any mass hysteria. 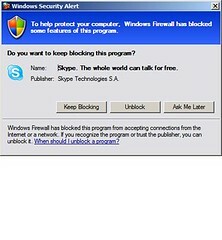 It is *not* a Microsoft Update and it is *not* blocking the Skype either. Observe… it is only a Windows Firewall Alerter notification which is treating Skype as non-generic, win32-unassociated, port 80 trailer application trying to access the Internet AND thus Windows asking your consent as to allow or deny this application. Cool enough, but it did spring to life all of a sudden after Microsoft update was run. MS do have a reasonable history of *accidentally* blocking apps they percieve as being competitive. Hope it helps others too. P.s. they also will provide a new connection if the isp block the ip you connect to to establish a vpn. Read all about it on the site.